Contest start date: May 1 2015. Work submission end date: August 3 2015. Voting end date: August 4 2015. Contest result announcement date: August 5 2015. Contest description: This contest is devoted to creations of an extraordinary Spanish architect and sculptor, Antoni Gaudíi Cornet, a person gifted with great talent and even greater diligence and perseverance. He created hisownunique and easily recognized style –organic architecture. He created eighte en architectur al modern style masterpieces, which have become world-famous. The Casa Vicens, the El Capricho, the structures of Park Guell, the Sagrada Familia temple are all renowned monuments of architecture that nevercease to amaze. - Be sure to tick the box titled “Participating in the contest “Fabulous houses of Antoni Gaudí””. The contest admit sone portfolio per participant, each containing three to seven works. After the end of the contest “Fabulous houses of Antoni Gaudí”, the portfolios created specifically for this competition will be continuing to take part in the main contest of project VATIKAM“Best Works of 2015” as per the regular rules. Winners of the first three prizes in each nomination are participants with portfolios that gather the most votes through the complete voting period. Both participants themselves and registered visitors and guests can give votes for works.To maintain voting objectivity, a rule is set that each registered participant or user may vote only once for one portfolio. Contest awards: Contest winners VATIKAM website. Winners also will receive special 1st, 2nd and 3rd diplomas of the International Association VATIKAM. Works of the three winners with first places in each nomination will show as banners in the top part of the homepage of VATIKAM website for 1 month (August 5 to September 4 2015). 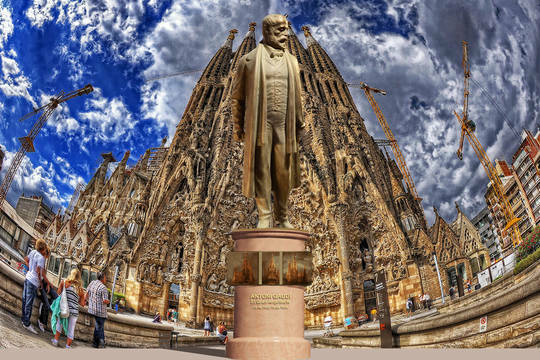 This contest is devoted to creations of an extraordinary Spanish architect and sculptor, Antoni Gaudíi Cornet, a person gifted with great talent and even greater diligence and perseverance.